Although I am otherwise distracted, I just want to comment on the wave of news flow about Fed policy and bond market mayhem. From a big picture perspective, nothing has really happened. With all due respects to the analysis of the recent Fed speakers, their comments did not really matter. They just underlined that doves will be doves, and similarly for hawks. What matters is what the committee thinks, and there is little information that suggests that a rate hike this year will be deflected. Although it would excite people if it were in September instead of December, I doubt the exact timing matters that much. The only real risk to the bond market is that they start picking up the pace of rate hikes -- to 50 basis points a year, say. Such an acceleration of rate hikes will only happen if we see an acceleration in growth. The exact same thing was true in 2012,2013,2014,2015, and 2016. What information do we have that 2017 will be any different? Although we need to respect the reality that past performance does not always predict future results, we still need some plausible reason that we will see a structural change in growth rates. Looking at the chart above, I fail to see how people can get excited about the latest yield moves. The 10-year Treasury yield is still lower than it was for most of the first half of this year. 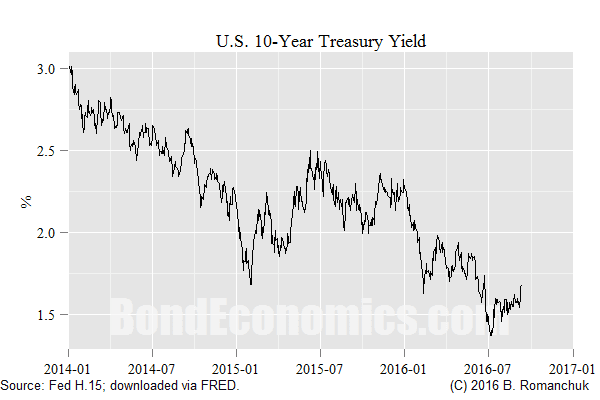 The theory appears to be that the bottom of yields is reached, and the trend in yields is now up. Of course, market commentators have called the last dozen of the past zero secular changes in global bond yields over the past couple of decades, so that is a discussion that causes my eyes to glaze over. More seriously, even if a bond bear market has started, bond investors would need to ask themselves -- what causes it to accelerate? Unless there is a reason to believe that central banks are seriously behind the curve, a bond bear market is going to be as grinding and slow as the previous bull market. I keep trying to understand the bond bear logic. There is still overcapacity and competition to produce at ever-lower prices. To make matters worse, despite the news that household income is up, wages are barely moving (at least in the US). It seems these realities will continue to exert deflationary pressure and I don't see them resolving. If something is going to change, it seems like it would have to be through some critical shortage of a commodity, which doesn't seem like a good thing, either. The world has changed. We're really, really good at producing stuff and we're still improving (unless you want a jet black iPhone 7 TODAY). Inflation (and higher rates) were for the old days when producing sufficient quantities of stuff was a problem. I used to be a raving bond bull, so no, I can't understand the bond bears either. (I don't take a stand either way now.) The logic is that interest rates are allegedly well below the "neutral real rate" that is assumed to be a constant 2% (ignoring the econometric estimates that put it closed to zero), and the Fed is behind the curve because the economy is allegedly near full employment. I think the belief that the central bank has to react immediately is a holdover from mainstream/Austrian economics that says that if the interest rate is not set exactly where it is supposed to be, the economy will rapidly spiral towards hyperinflation/hyperdeflation. This doctrine is indoctrinated in basic economic theory, and no amount of empirical data can convince them that the economy is not as sensitive to interest rates as they believe.